A black and white cat is a remarkably beautiful creation. 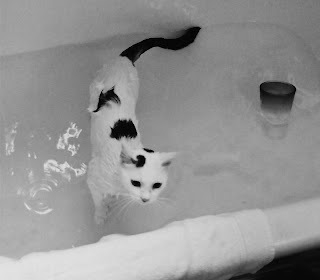 Funny how cats seem so little when they're all wet. Cosmo didn't mind a bath at all. 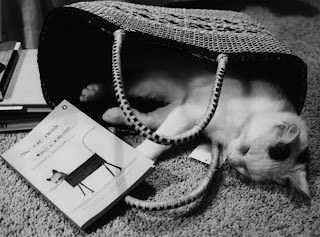 After reading "The Cat Inside" he decided to curl up in my tote bag. Our little cat friend passed away almost 4 years ago and he is still close to our hearts. The thing that was so incredibly sad was that he was fine one minute and paralyzed the next. That pain of confusion in his eyes as he struggled to move around until we could contact our vet will never leave my memory. I've never felt so helpless. And add to that, we had to make the decision to let him go. If any of you cat lovers out there have not read "My Cat Spit McGee" by Mississippi author Willie Morris, I suggest you do so. 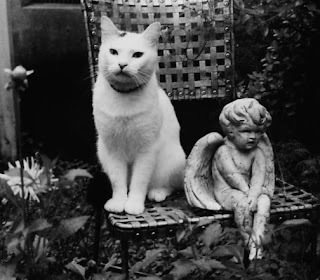 It is a most incredible story of how a "dog person" fell in love with a cat. I always like your stylish photos and write up. Mine would definately be a little peeved at the prospect of being that wet! Lovely shot of your cat in the basket, so sweet! Thanks for visitng my blogs:) Nice to see your back again. What a sweet looking cat. I love the photos too. Black and white cats are quite stunning. Thanks for stopping by my blog and commenting. You've had a number of fun sounding cats. all you post is realy cool . if you don't mind i am going to visit you moe times .